If the City Council approves the amendments, the city will become a model for other Maine communities and join a growing number of U.S. cities that have taken similar steps. SOUTH PORTLAND — City planning officials have proposed sweeping zoning changes that would both promote and regulate commercial and residential solar power installations. The changes would meet goals outlined in the city’s comprehensive and climate-action plans, and they would apply to large and small solar energy systems, both roof- and ground-mounted, said Tex Haeuser, city planning director. The changes would make it possible to install larger commercial arrays and would include solar panels among equipment that can be installed on nonresidential rooftops without violating building height limits. Currently, solar arrays aren’t permitted explicitly in any zoning district. “Right now, you would not be allowed to build a solar project in the city unless it was an accessory use and it would be limited to 250 kilowatts,” Haeuser said. The Planning Board voted 5-0 last month to recommended the zoning changes. The City Council is set to consider them at a workshop Monday. If the council approves the changes, South Portland would join a growing number of U.S. cities that have taken similar steps in recent years, from Boulder, Colorado, to Ithaca, New York, and from Seattle, Washington, to Erie, Pennsylvania, according to the American Planning Association. Glen Brand, director of Sierra Club Maine, said South Portland’s proposal would provide a model for other Maine communities. “South Portland’s action is an example of much-needed local leadership on clean energy during an era of backward thinking and obstructionism on energy and climate issues,” Brand said. Last week, the Maine House upheld Gov. Paul LePage’s veto of a solar bill that he said would increase energy costs, drive businesses away from Maine and kill jobs. Supporters said the bill would help modernize Maine’s economy by creating good-paying jobs in the expanding field of renewable energy. The bill, L.D. 1649, aimed to add 196 megawatts of solar energy to the state’s energy portfolio over the next four years. Maine has roughly 20 megawatts of installed solar energy today. In a memo to the council, Haeuser noted that South Portland officials have reviewed proposals for larger, stand-alone systems, including a potential 660-kilowatt array that the city would install on its capped former landfill. The Fire Department also has indicated the need for standards to address potential issues with fighting fires in buildings with rooftop arrays, Haeuser said. And because solar energy is increasingly popular, it seems appropriate for the city to anticipate and address concerns that might crop up in construction and development projects, he said. The proposed amendments are written throughout descriptions of various zoning districts, requirements for site plan review and building performance standards. In residential zones, rooftop solar arrays couldn’t exceed the maximum allowed building height. In mixed-use, commercial and industrial zones, rooftop arrays would be regulated like any other mechanical systems, such as air-conditioning units. Ground-mounted arrays in residential and mixed-use zones could be no more than 12 feet tall at maximum tilt; however, if an array were at least 30 feet from any property line, it could be up to 20 feet tall. Ground-mounted arrays in all other zones would have to conform to their respective building height requirements. All ground-mounted arrays would have to meet standard building setback requirements. In residential zones, they couldn’t be installed in front yards unless they were sited more than 100 feet from front property lines; they couldn’t be installed in side yards unless they are sited more than 50 feet from side property lines. To meet fire safety concerns, rooftop arrays would require a 3-foot pathway along three sides of the roof so firefighters could access buildings in emergencies. They also would require a cutoff switch near the outside electrical meter box so firefighters could stop power flow if necessary. The meter box would have to be labeled so firefighters would know a structure was supplied with solar electricity. 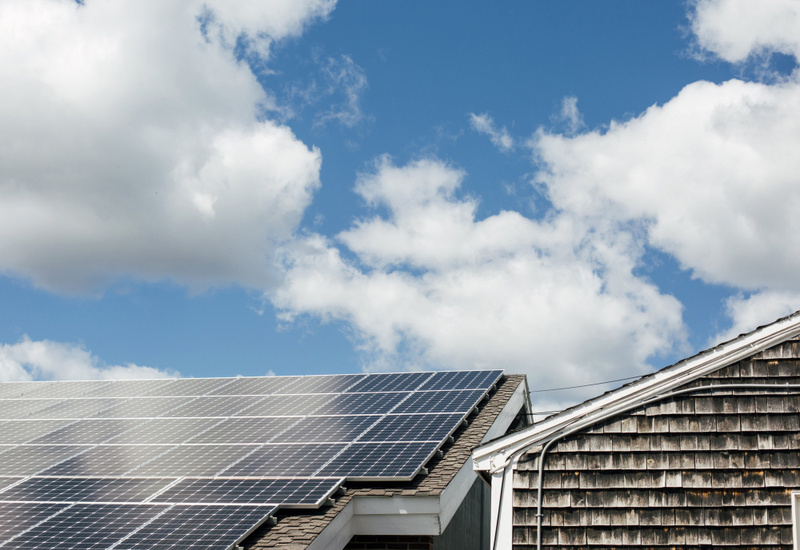 If a solar collector stopped functioning for more than 12 consecutive months, the property owner would be required to remove it within 90 days of the 12-month period.